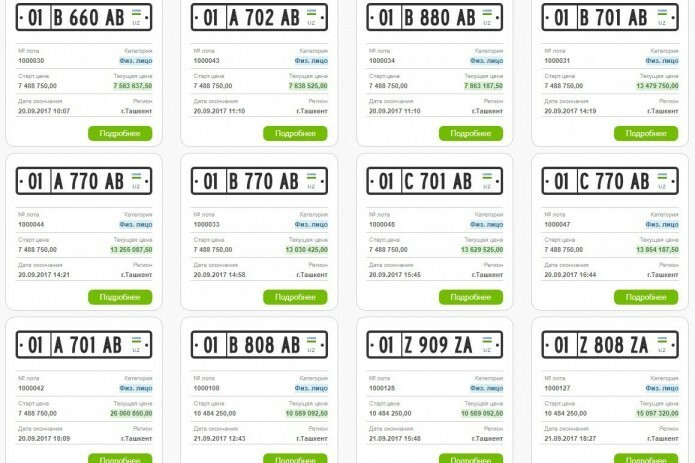 More than 110 registration plates for motor vehicles worth over 2 billion soums have been sold since auction through www.avtoraqam.uzex.uz of UZEX was launched. Most active buyers were motorists of the Tashkent city and Tashkent region. Meantime, online auctions have already been held in the Republic of Karakalpakstan and Jizzakh, Bukhara, Samarkand, Kashkadarya, Khorezm, Andijan and Ferghana regions. Revenues from the sales of car license plates are channeled to the State budget of the Republic of Uzbekistan.